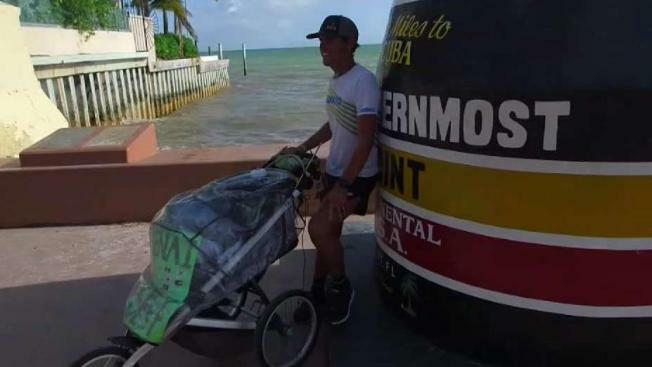 Pete Kostelnick jogged up to a Key West marker as he hoped his feat would inspire others to chase their wildest dreams. The 31-year-old Ohio man started July 31 at Anchor Point on Alaska's Kenai Peninsula, running without a support vehicle to Florida. An ultramarathon runner has finished a nearly 5,400-mile diagonal, cross-continental run that began in Alaska and ended in Florida. The 31-year-old Ohio man started July 31 at Anchor Point on Alaska's Kenai Peninsula, running without a support vehicle to Florida. Pushing supplies in a three-wheel jogging stroller, he said he averaged some 55 miles per day. In 2016, Kostelnick ran 3,067 miles from San Francisco to New York City in 42.25 days. He said he hoped his feat would inspire others to chase their wildest dreams. He added some people have compared him to Forrest Gump, the primary character in the 1994 film by the same name, where Gump ran cross-country several times.